He was standing on top of a bank of cages at the rescue, and had just been mildly startled by something off in the distance. So he stretched his neck up to see better. Can’t you just hear the clucking? 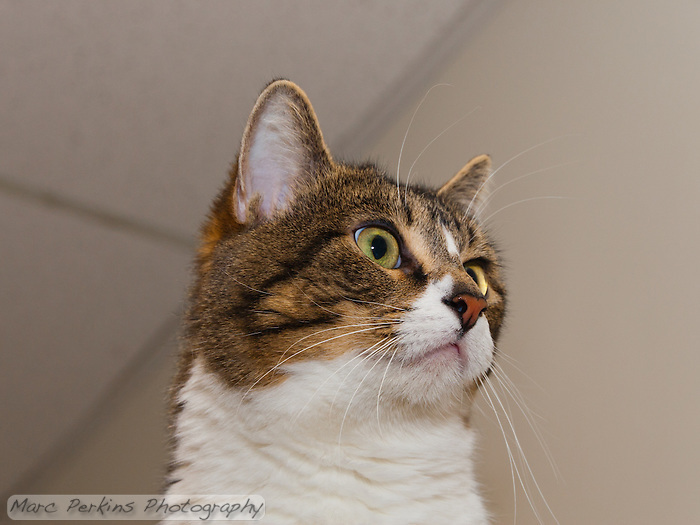 To see more cats available for adoption at Miss Kitty’s Rescue in Orange County, CA, head to my cats available for adoption in Orange County, CA page. To see more cat pictures I’ve taken, you can see a list of all of my pet posts, or head straight to my pets portfolio page. I don’t like pictures of animals in cages, especially ones that are clearly behind bars. 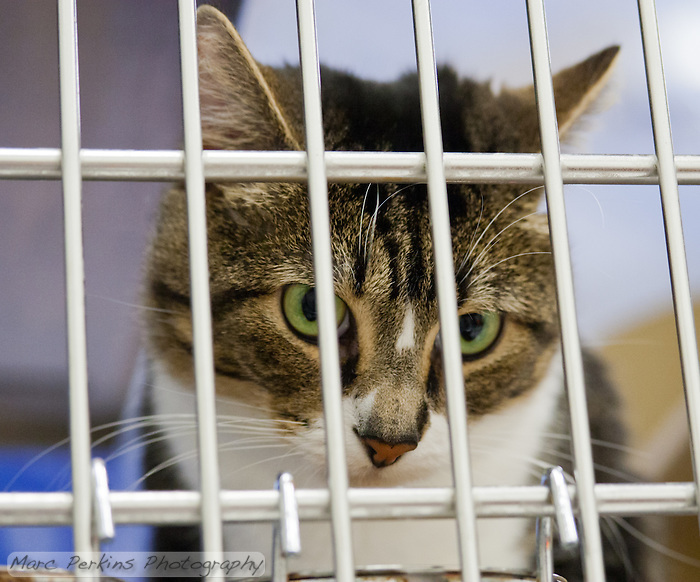 But while I was photographing cats available for adoption at Miss Kitty’s Rescue last week I decided to take a few “behind the bars” images, and I’ll hesitantly share them here. 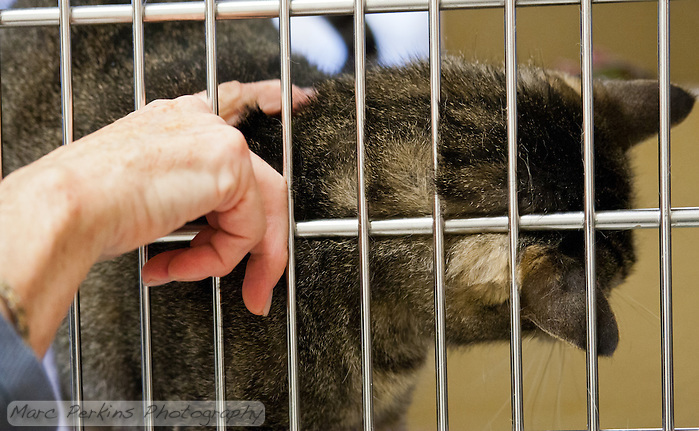 The reason for sharing them is simple: living in cages is the reality for many cats. There are simply too many cats, and not enough loving enough homes for them all. 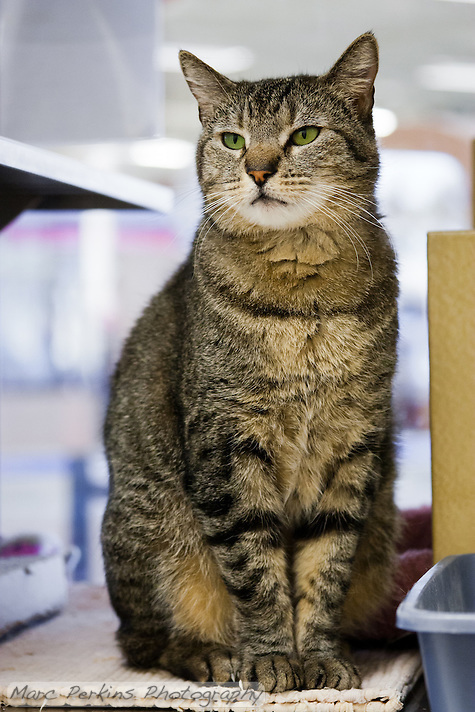 Awesome cats like Oliver and Trista end up being born feral or getting tossed out onto the street by an unloving owner. If they’re lucky, they’re picked up by a rescue like Miss Kitty’s, who befriends them and sees if they could make a good pet. If they can make a good pet they live in a foster home for some time, then move to a cage at a display location like Petsmart in the hopes that someone will adopt them, enduring the hundreds of kids and dogs that knock on their cage’s window and bark at them. And that’s if they’re lucky. Oliver looks out from behind the bars of his cage. Trista comes up to the bars of her cage to ask for petting. Mindy, who runs the rescue, pets her. When you do want a new companion, adopt a pet in need (not from a breeder). But if you can’t adopt right now, you can also help spread the word about pets in need of adoption. You could also volunteer to help at your local rescue or shelter; they’re always looking for good people (and if you’re a photographer, see if they want a volunteer photographer). Or donate to organizations like the Humane Society, an organization that works to, among other things, fund efforts to spay and neuter cats and dogs to help reduce the pet overpopulation problem. Whatever you do, just make it so that I don’t need to take pictures of cats in need of a home anymore. Both of these cats (as of this writing) are currently available for adoption through Miss Kitty’s Rescue in Costa Mesa, CA. For more information on the rescue, and to find out how to adopt them, contact Mindy at misskittysrescue@yahoo.com. 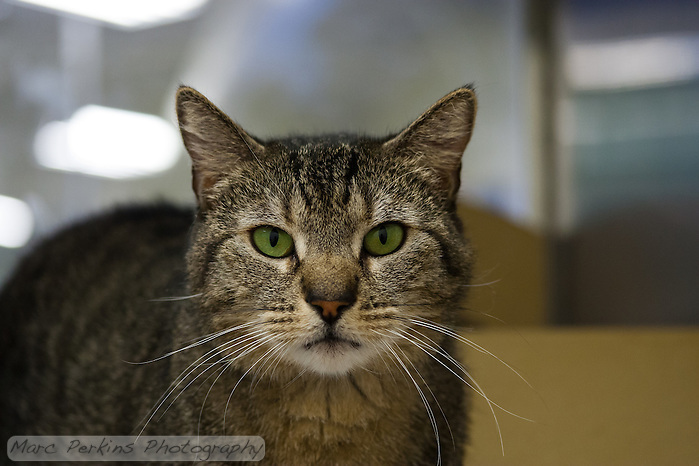 Trista, a three year old female short-haired brown tabby cat with green eyes, is looking for a new home in Orange County, CA. 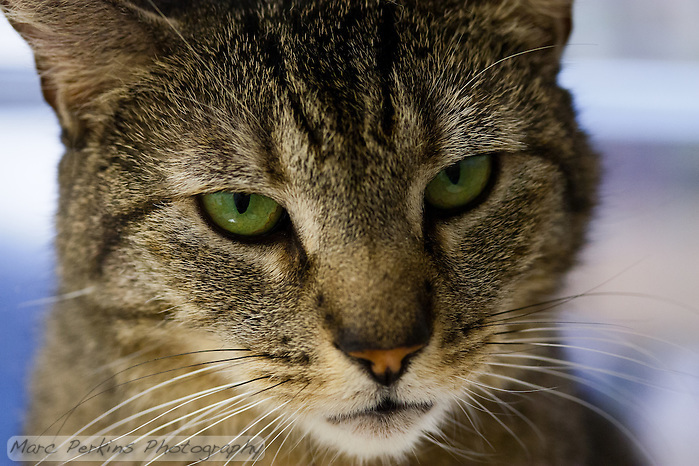 Trista is a gorgeous cat; her face reminds both Michelle and me a bit of a mountain lion’s. And when she stands or sits, she emanates grace and power. Trista has a calm facade (and a white chin! ), but underneath it she’s a playful, outgoing kitty. 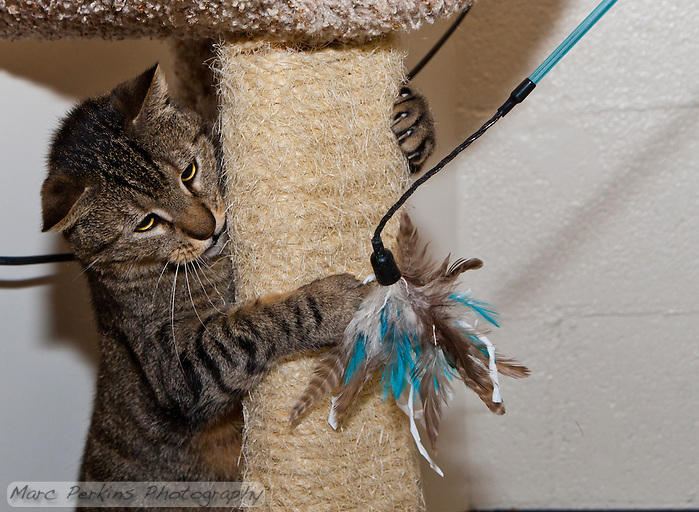 Trista playing with a feather toy from behind a sisal-wrapped cat tree post. 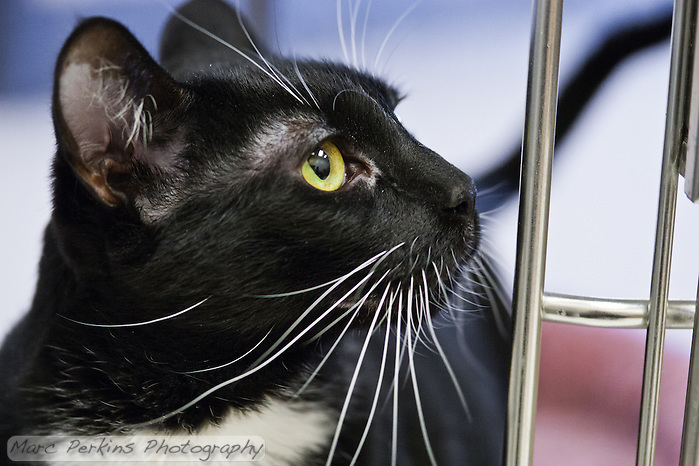 You know how sometimes when you head to a rescue, a cat just grabs your attention? For me on this trip, that cat was Trista – she’s got a beautiful pattern, a unique face, and she was a ton of fun to photograph. 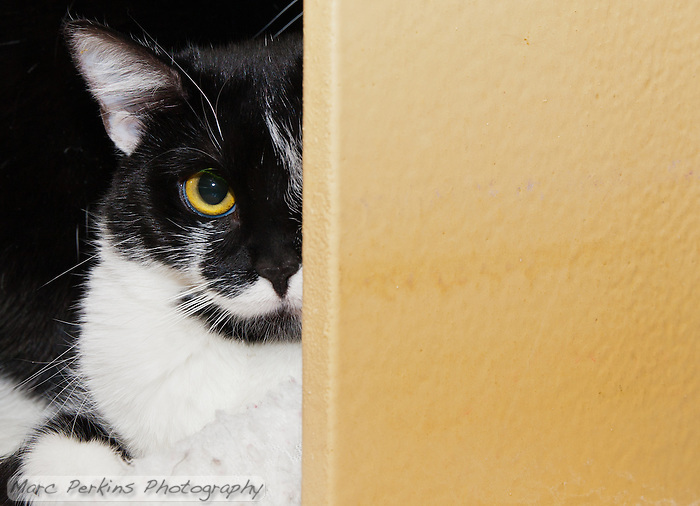 Trista is currently available for adoption through Miss Kitty’s Rescue in Costa Mesa, CA. For more information, and to find out how to adopt her, contact Mindy at misskittysrescue@yahoo.com. 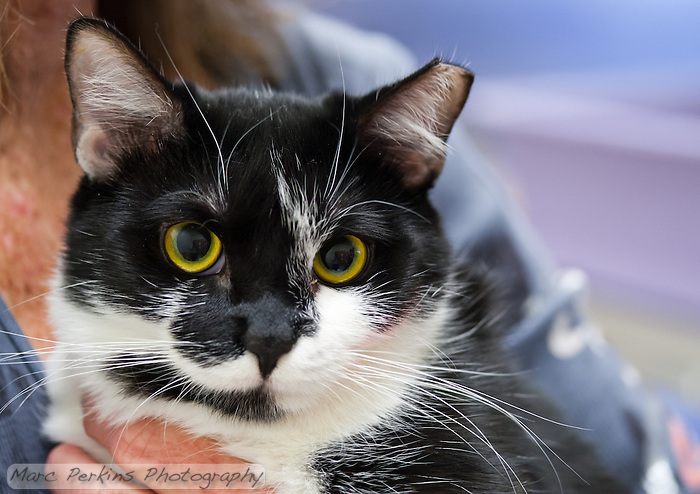 Molly, a two year old bicolor tuxedo white and black short-haired female cat, is looking for a new home in Orange County, CA. Molly is a very playful and fun loving cat who loves to ride on people’s shoulders and interact with dogs; she would not be good with small children. 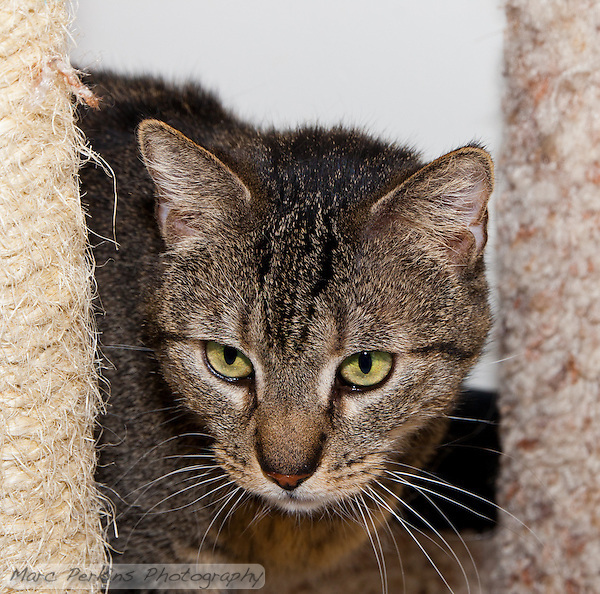 Molly is currently no longer available for adoption through Miss Kitty’s Rescue in Costa Mesa, CA. For more information, and to find out how to adopt her, contact Mindy at misskittysrescue@yahoo.com. 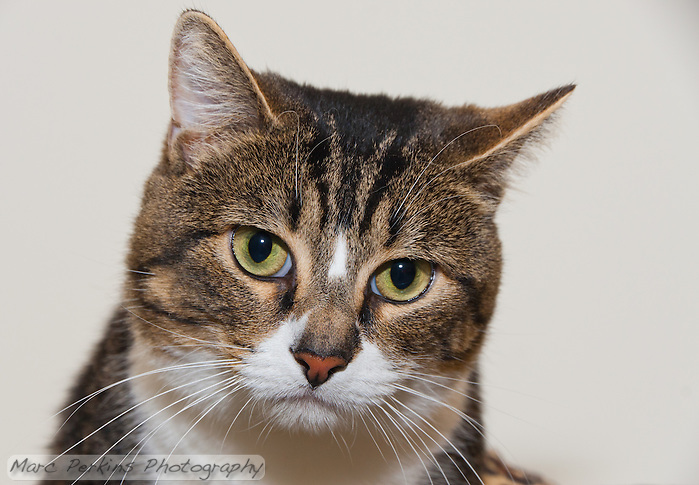 Oliver, a two year old male short-haired brown tabby and white cat, is waiting for a home in Orange County, CA. 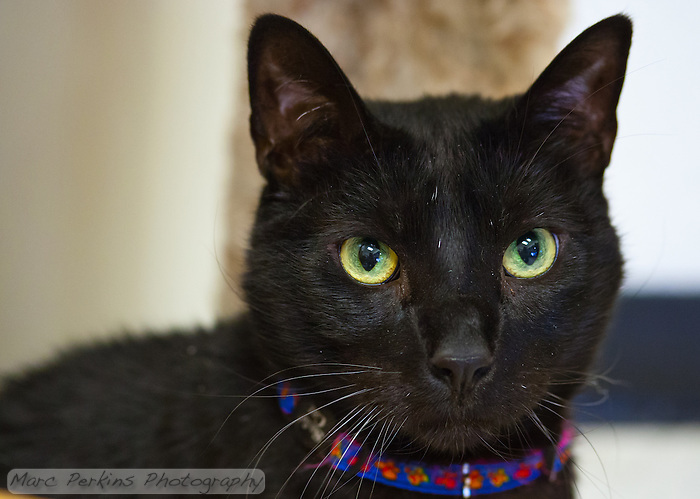 Oliver is a sweet cat who needs a home with no dogs and no kids. He loves to explore his environment, and can be frequently found sneaking through a fabric tube in the rescue. Oliver popping out of a fabric tube. 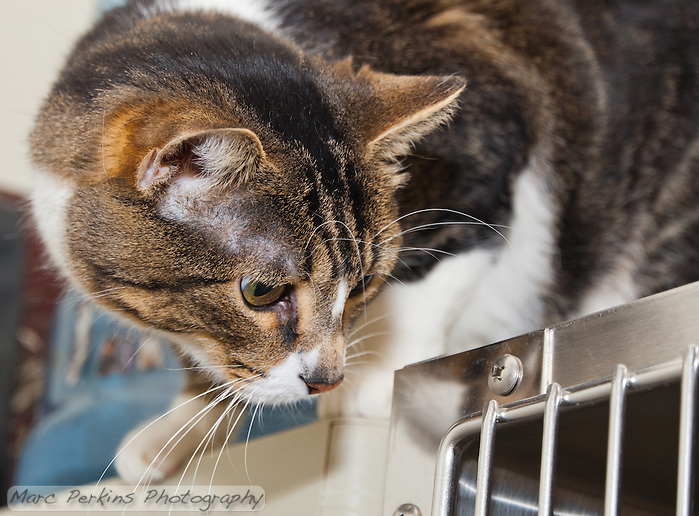 Oliver sniffs the corner of a cat cage at his rescue. 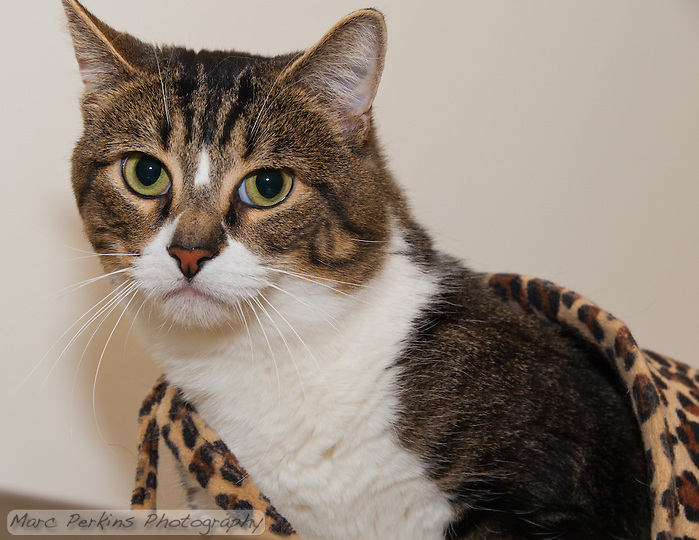 Oliver is currently no longer available for adoption through Miss Kitty’s Rescue in Costa Mesa, CA. For more information, and to find out how to adopt him, contact Mindy at misskittysrescue@yahoo.com. 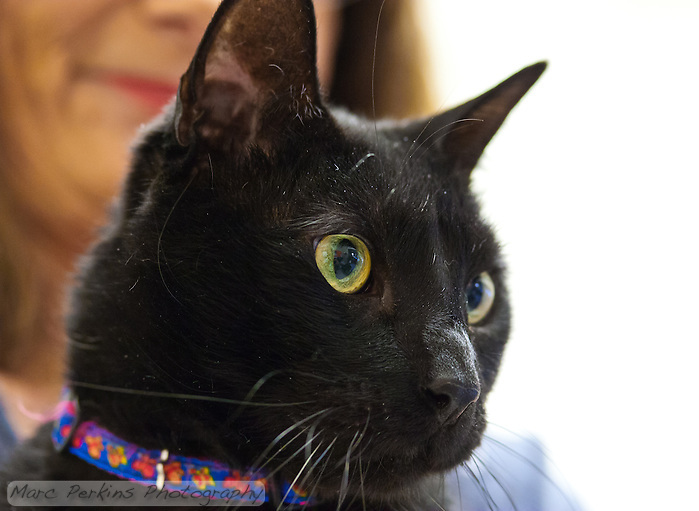 Hurricane is a seven year old male short-haired black cat waiting for a home in Orange County, CA. 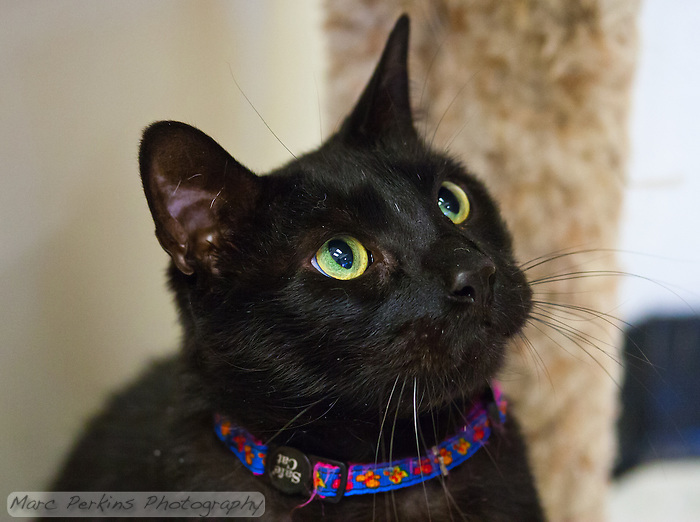 Hurricane is a very intelligent, outgoing cat who loves people and is not afraid of anything, but who needs to live in a house without other pets as he can be aggressive to other cats and dogs. Hurricane in Mindy Millers arms. 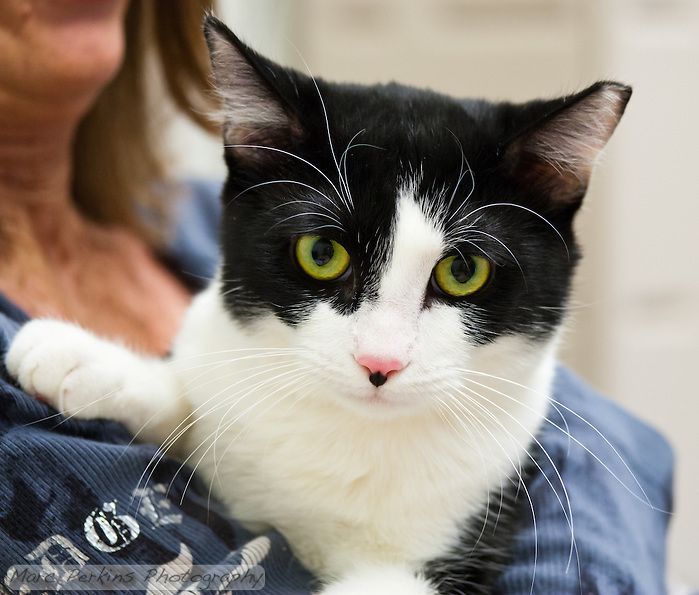 Hurricane is currently available for adoption through Miss Kitty’s Rescue in Costa Mesa, CA. For more information, and to find out how to adopt him, contact Mindy at misskittysrescue@yahoo.com. 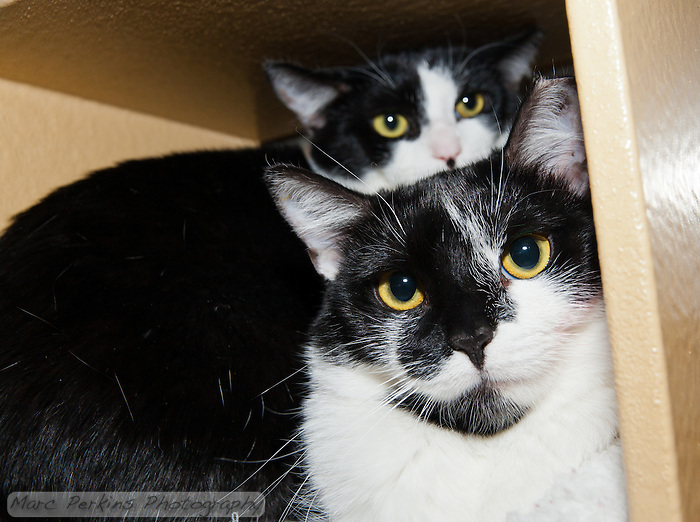 Zoey and Porsche are two sisters waiting for a home in Orange County, CA. They’re both short-haired white and black bicolor female cats with yellow-green eyes. They’re both less than a year old, and they need to be adopted together as a pair. They’re a bit shy and scared in the rescue, but they’re very playful with toys and each other, and will warm up once they get to a house where they’re given a space they can call their own. Zoey peers out from behind a wall. 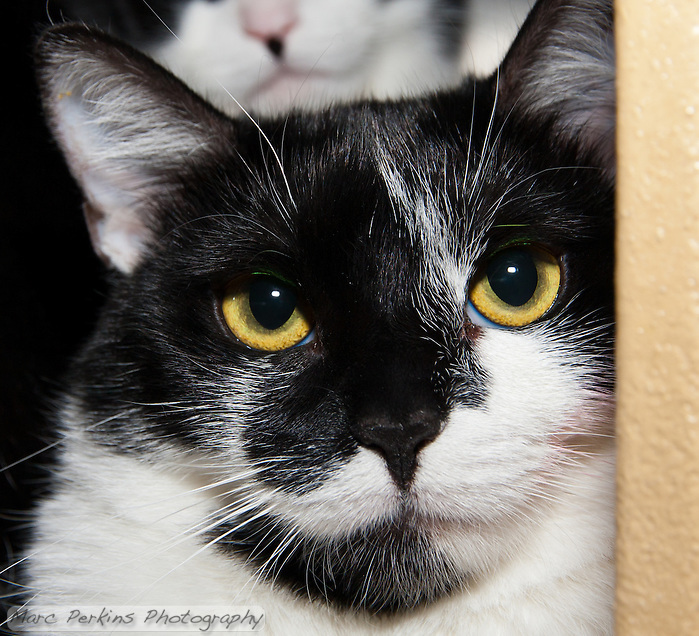 Zoey and Porsche are currently available for adoption through Miss Kitty’s Rescue in Costa Mesa, CA. 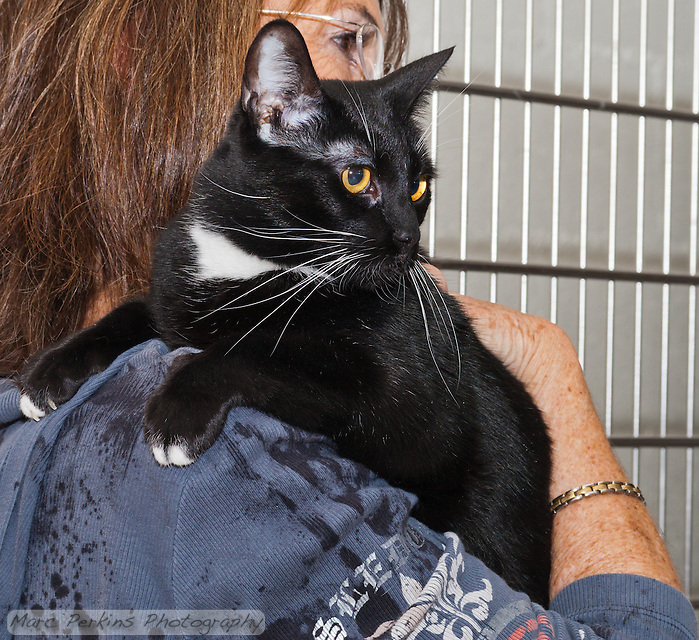 For more information on the cats, and to find out how to adopt them, contact Mindy at misskittysrescue@yahoo.com.